Heat oil medium hot, add banana fry until golden brown about 5 minutes for caramel banana. Drain the oil, then place banana in the serving bowl. Add water into the pan with sugar, salt and stir constandly until boiling, add coconut milk bring back to the boil, then pour over banana. Add tapioca on the side. 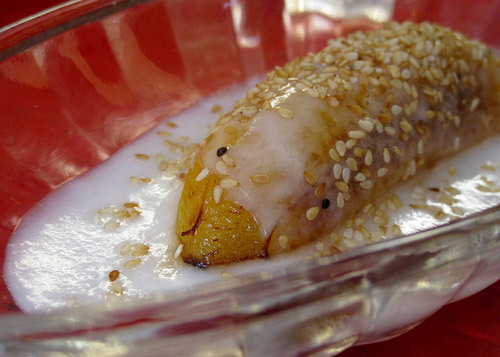 GANISH: Sesame seeds and ice cream.